Pooja with her lovely card that really embodies the meaning of Geometric! Please contact us on Ablognamedhero@gmail.com so we can sort out your prize for you! Cindy used her geometric planters to fulfil the challenge requirements–smart thinking! Thank you all for entering!! As always, we so appreciate your support. Happy almost November! Lisa here, and I’ve really enjoyed this geometric challenge. Might be because I’ve had these dies burning a hole in my stash and needed a reason to use them. 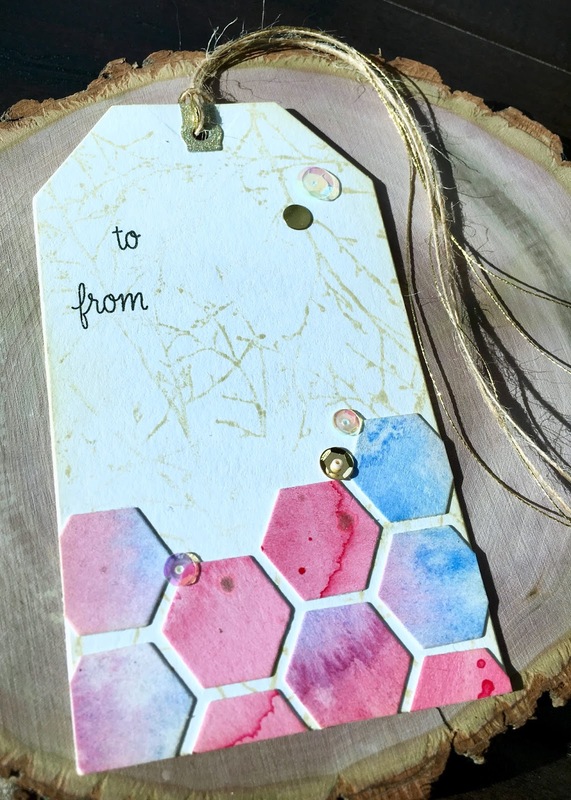 I made a gift tag. Tis the season and I’m always making something as a gift and by the time I’m finished with a gift, I’d rather not have to make a card or tag to go with it, so I thought I’d build up a stockpile. I did some simple watercoloring and then once it was dry, used a small hexagon die to cut out some particularly interesting sections of the watercolor paper. The tag itself is made from two sheets of cardstock adhered together, and die cut with the largest of the new Hero Arts infinity tag dies. That set may as well just stay on top of my desk, I know I’ll get so much use from it. And you’ll notice that I used one of the reinforcement dies to add some glitter cardstock to the top. The background of the tag was stamped using the Branches Bold Prints stamp, and I wiped a bit of ink off of it before I stamped. I wanted to be able to write a message on the tag without too much interference. You’ve got just a couple hours left to enter the challenge. Come back tomorrow to see who won! Hello! 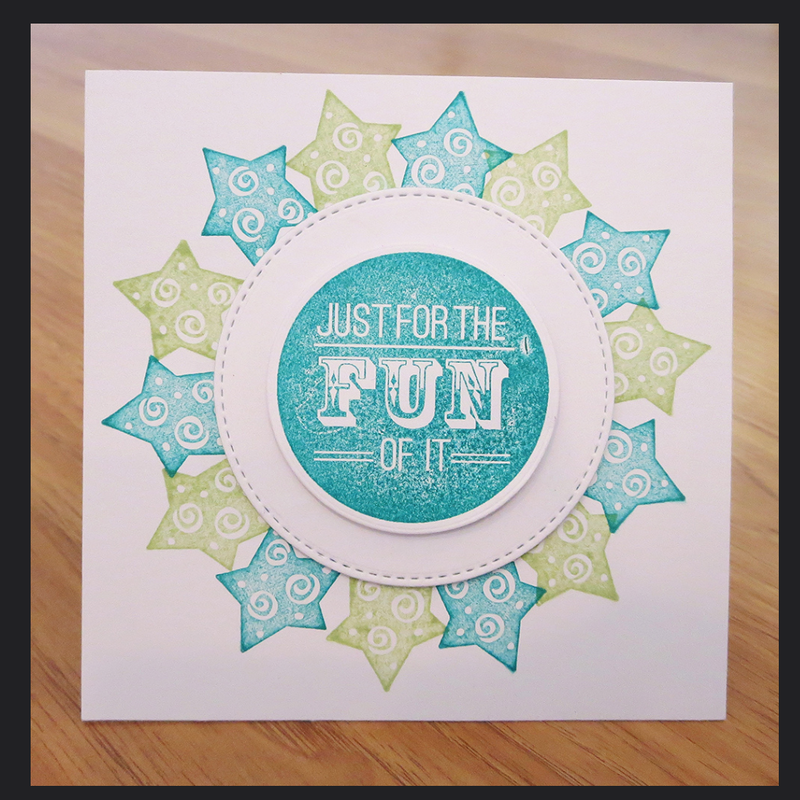 The Crafty Nurse here again with a card for our “Geometric” challenge at A Blog Named Hero. This month we have been celebrating all that is Hero Arts. 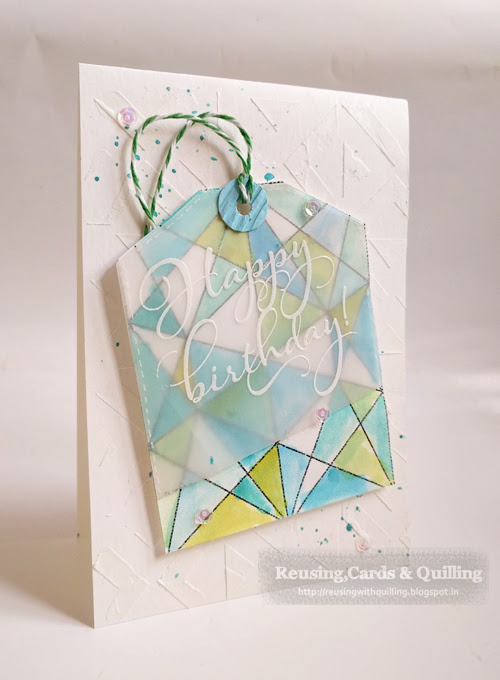 I learned this geometric distress technique from the fabulous card maker, Laura Bassen in a Craftsy Course she teaches. If you haven’t taken any of the Craftsy classes they are fabulous. I like to send my cards to Send a Smile 4 Kids, so I made a kid friendly geometric card. 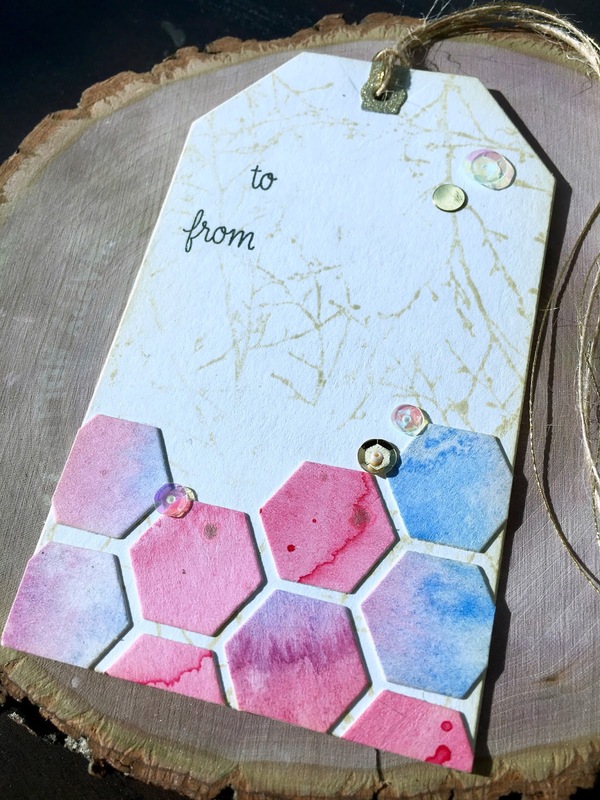 I hope you’ll join us at A Blog Named Hero for our October “Geometric” Card Challenge! My thought for this card was to emphasize the shapes and the focal point which would be geometric – the challenge theme for this month. Our products featured this month are Hero Arts! I began by making the shaker. The sentiment was stamped and clear embossed on the copper metallic paper. Die cut the window on the rectangle and added acetate to the window. Foam tape was pieced all around, sequins and the sentiment piece added. Then I stamped the leaves in Versamark on the card base and put on the silver and copper metallic leaf and added all to the card. 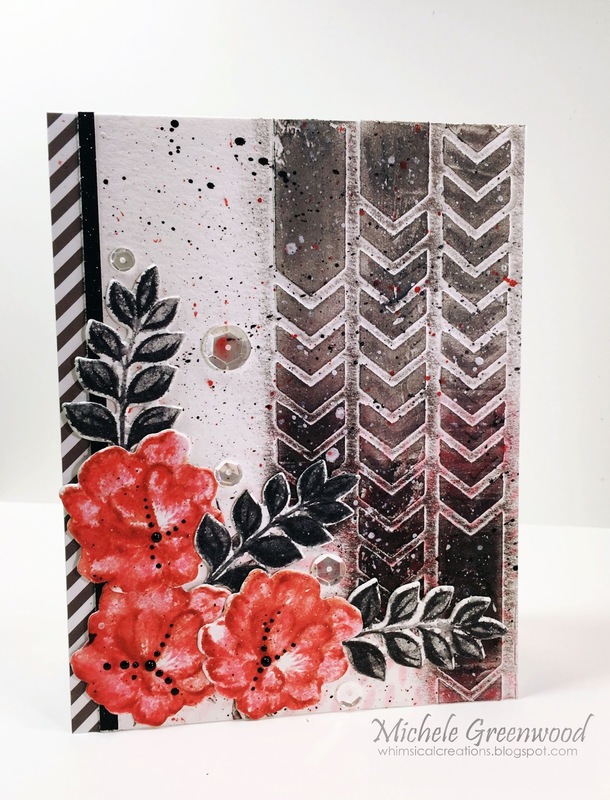 The sentiment and copper paper are from the Hero Arts September Monthly Kit – these kits are a fabulous buy and sell out quickly. When they are released on the first Monday of the month you need to get online pronto and buy!!! I used acetate that I had received in a previous kit, but Hero is now selling sheets of this in two different sizes. You can link your card here or in the upper right corner of this post. Our prize this month is the wonderful Color Layering Grateful Leaves (my leaf on the card)!! Thanks for stopping by and love to read your kind comments. 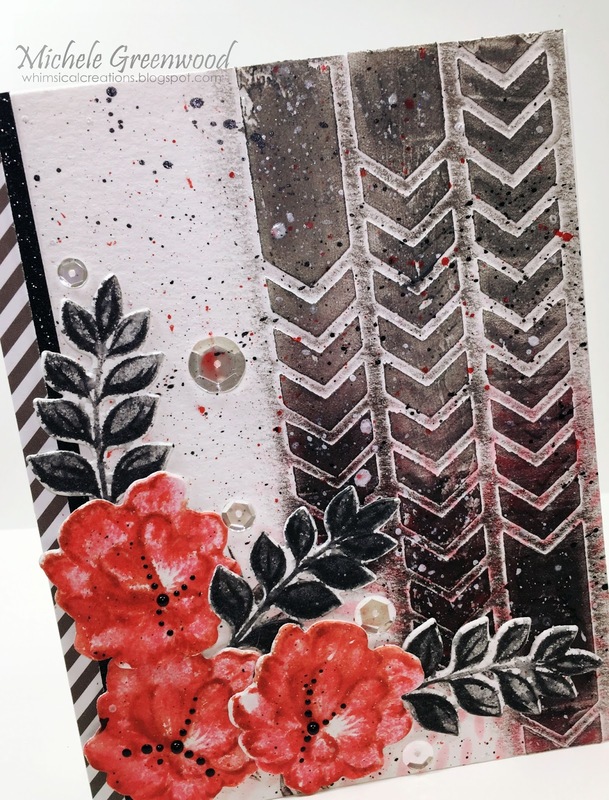 I actually started the card by sponging Spun Sugar and Worn Lipstick with the HA delicate petals stencil (lower right hand corner). Then I used the HA arrow stencil and added 3 lines of arrows with whipped spackle, each at varying lengths. Once dry I added gray, black and a wee bit of red distress crayons and rubbed those in with my finger. I recommend waiting till the whipped spackling dries completely…just stating for a friend, I wouldn’t really know first-hand. HA! I took a separate piece of water color paper and stamped the layering flower in Worn Lipstick, Barn Door, and Fired Brick; once stamped, I spritzed with water and let them run. I stamped the leaves in Black Soot, 3rd and 2nd generation stamping, also spritzing with water, then cut with matching dies. I adhered all the images, cut the panel down slightly and added a strip of black glitter paper and MFT gray and white striped paper; the entire panel was adhered to a Neenah 110 lb. white card base. Finished it off with lots of splattering and a handful of sequins. Thanks for stopping by; hope you’ll join our geometric challenge; we love seeing your creations!